Talon puts all your crisis management, business continuity and emergency response plans in a clever mobile app. When a crisis hits, paper-based plans might not be at hand, and a cyber-security threat could make them totally unavailable. Talon puts all of your crisis information in one place – immediately and easily accessible to your team. Working with Kestrel has given clarity, good process and structure to our Business Continuity arrangements. Throughout the process Karen, Sandra and their team have listened to our people. They take time to understand what plans we have in place and what we needed to improve. The ability to use the Talon app was seen as a major benefit as it removed the need to carry cumbersome documents around at all times. The Kestrel team are fantastic to work with, they are so flexible in how they approach what’s needed and the credibility they bring to a discussion with senior managers is huge. 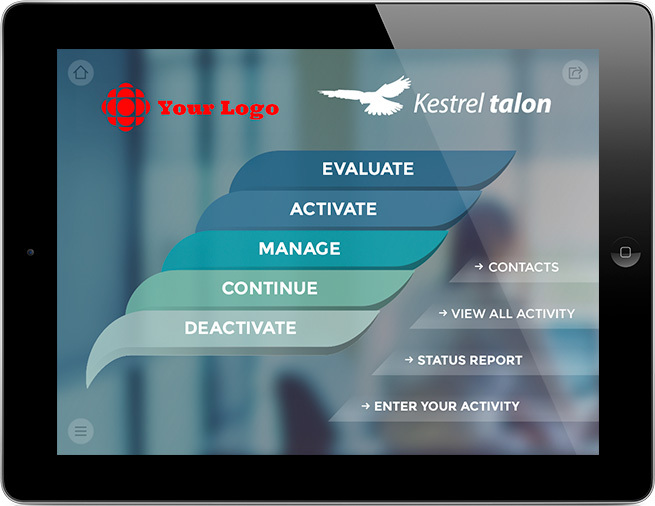 Kestrel’s Talon was so well received within our Executive Team and easy to use, that we have extended its use to include our Airport Emergency Response Plans. Kestrel’s exercises are tailored to our unique environment and they have liaised with emergency services to add realism and allow us to practise our interactions with those services. Kestrel are always professional in their approach and, as a result, our executive management teams have improved their response capability and gained useful insights during the exercises. With their experience Kestrel know how best to do things; yet they are good listeners, understand our circumstances and meet all our demands. Once your crisis plans and information have been uploaded, Talon is easily installed on mobile devices. It is maintained in the cloud - independent of your internal IT systems. You can scale your Talon investment up or down as needed. Talon is Invoiced per user on a monthly basis, with a 30-day cancel anytime policy. Pricing starts from $250 per month for 10 users on the Basic plan. Please contact us so we can work out options that would best suit your organisation. Check out Talon for yourself with a 14-day free trial, or request a demo. Contact us to arrange. Talon is a mobile app designed to house your crisis management, business continuity and disaster recovery plans. Its key function is to make up-to-date crisis information immediately and easily available to your crisis team. Our clients have been asking for a mobile solution as an alternative to wallet cards, flip charts, and paper plans. These paper-based resources need to be reproduced every time there’s an update. This can lead to multiple versions where no one is sure if they have the right one. Kestrel has partnered with Wellington-based technology company, Showcase Workshop. It provides a mature and stable platform for Talon. Showcase Workshop has more than 10,000 global users, and a reputation for excellence. What kind of support is available for Talon? Kestrel is your first port of call for Talon support, but we’re backed by Showcase Workshop’s helpdesk should there be a thorny technical issue. Where is Talon's data stored and how secure is it? Will Talon work when there's no internet connection? Yes, Talon caches the documents and data on the device so you don’t need an internet connection to use it. Some interactive features need an internet connection, for example; publishing or viewing crisis activity, text alerts, and receiving updates. However, outgoing data is queued until the internet connection is restored so you don’t lose anything. What devices does Talon run on? The free Showcase Workshop app is available from the Apple app store, Google Play store, Chrome Web store, and Windows store. Once installed, simply log in to access Talon (log in can be cached). What's involved in setting up Talon for an organisation? How do we make changes to information in Talon? We include two hours of document replacement for Talon each year. This is usually enough to replace all the documents in Talon at least once. Anything over two hours is charged at time and materials. For Pro and Premium clients we can train your own administrators. This way you can maintain your own documents and information within Talon. The initial setup is billed as a one-off cost. Then a monthly subscription is set up based on your plan and number of users. You can add or remove users at any time and cancel anytime with 30 days notice.